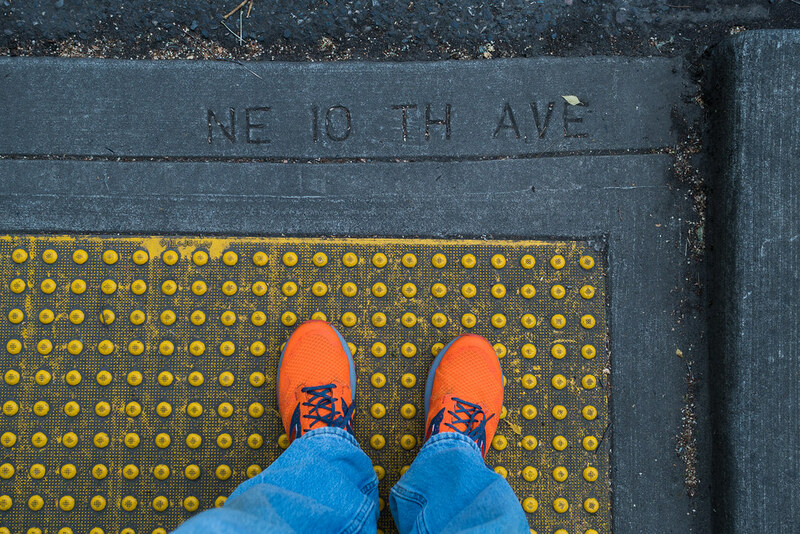 The north-south streets in our neighborhood are numbered and labeled as avenues, such as NE 10th Ave. 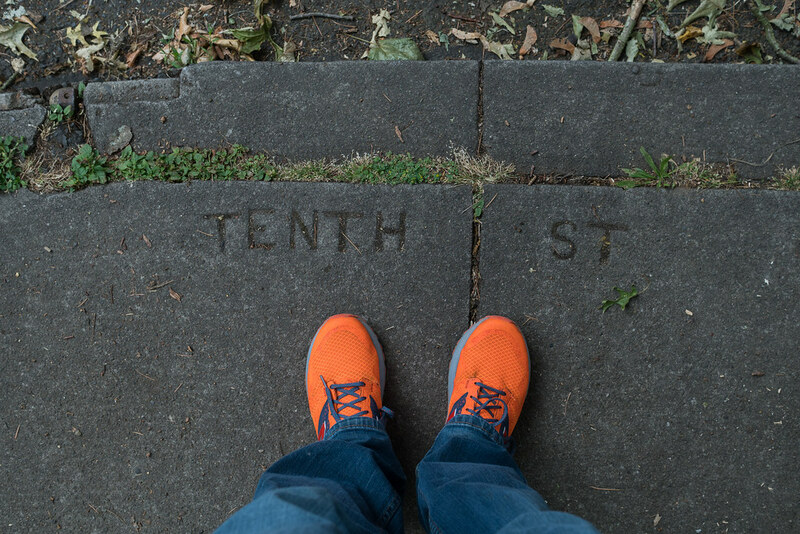 The east-west streets are named and are labeled as streets, such as NE Knott St. One of the charming parts of the old neighborhood is that the street names are written into the edges of the sidewalk as you approach an intersection, a nice touch to help you keep your bearings as you’re walking around. I was amused early on that the labeling for the avenues actually said street, such as Tenth Street shown here, but over time I noticed that this ‘mistake’ happened at nearly every intersection, leading me to wonder if it was not a mistake but rather that these were the original names. That is indeed the case. It was in 1931 that the growing city standardized on the current naming system for streets, which is how Tenth Street became NE 10th Ave. In between I think it may have been E 10th N (and I have seen this in the sidewalks at a few places). Many of the homes (and certainly the sidewalks) were already in place by then, ours included, thus the prevalence of the old street name. But there is more than whimsy to street names in this city, as there is a long and dark history of racial injustice here and across Oregon, one example being how redlining was used to target minority communities based on neighborhood. When we bought our house fifteen years ago, one of our neighbors was an elderly black woman who I think bought her house in the 1950’s and raised her family there. She told me about how she worked in the shipyards repairing large ships, suspended out over the edge as she did her work. I could feel my fear of heights rising just a bit, standing there firmly in my yard, listening to her talk about how far she was above the ground. She told me about the time a domestic abuser pushed one of her friends off her perch and killed her. She told me about how one of her white neighbors would dump their trash over and over into her yard, to make it clear she was not welcome, and then said while it might sound funny in a way she missed those times. Not that she missed picking up the trash out of her yard, but that she missed knowing where people stood, knowing who hated her based on the color of her skin. That those feelings hadn’t gone away, just gone underground. She died years ago but I think of her and her family often, and how they were treated and how they persevered. They were good folks and good neighbors. She lived long enough to see a black President but not long enough to see the backlash and the metaphorical return of her trash-dumping neighbors across the country and in places of power. And if it’s depressing, and it is, I take hope in little signs of progress. Even one as simple as this, two blocks south of the picture at the top of the post, a remodeled intersection at 10th and Knott that now has a gradual ramp down to the street, with a yellow pad providing some traction and resistance, making it easier for people with wheelchairs or walkers to get about their neighborhood. A nice touch that they still put in the street name at the edge (this one shows the modern name, some others stick to the original name), but I’d take the ramp over the name if it came to that. It’s better too for people with strollers, and kids on bikes who are too young to be on busy Knott Street, and even just older people (and dogs) who find the ramp a bit easier than a step. And I think of how sometimes it takes lots of little steps for progress to be made, like when I walk by an assisted living facility with an old iteration of ramp design, where there is just one steep ramp that points to the middle of the intersection. I was walking home one day and in the distance saw a man in a wheelchair who got around by pushing himself with his feet, struggling to get up the steep ramp, knowing if he lost his grip he’d go out into the intersection. He made it up before I got there, but I think of him and how simple changes in his health can keep him from getting out and being a part of the neighborhood, and how simple changes in the infrastructure can help keep him active. As we celebrate our nation’s independence I hope we move towards a world where we don’t just say all are created equal, but live it. All races, all abilities, all genders, all people. All equal. This entry was posted in Street & Travel and tagged Irvington, Oregon, Portland. Bookmark the permalink.